VersaStack, an IBM® and Cisco integrated infrastructure solution, combines computing, networking, and storage into a single integrated system. It combines the Cisco Unified Computing System (Cisco UCS) Integrated Infrastructure with IBM Spectrum Virtualize™, which includes IBM FlashSystem® V9000 and IBM Storwize® storage offerings, for quick deployment and rapid time to value for the implementation of modern infrastructures. 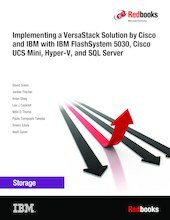 This IBM Redbooks® publication covers the preferred practices for implementing a VersaStack Solution with IBM Storwize V5000 Gen2, Cisco UCS Mini, Hyper-V 2016, and Microsoft SQL Server. Cisco UCS Mini is optimized for branch and remote offices, point-of-sale locations, and smaller IT environments. It is the ideal solution for customers who need fewer servers but still want the comprehensive management capabilities provided by Cisco UCS Manager. The IBM Storwize V5000 Gen2 delivers efficient, entry-level configurations that are designed to meet the needs of small and midsize businesses. Designed to provide organizations with the ability to consolidate and share data at an affordable price, the IBM Storwize V5000 Gen2 offers advanced software capabilities such as clustering, IBM Easy Tier®, replication and snapshots that are found in more expensive systems. This book is intended for pre-sales and post-sales technical support professionals and storage administrators who are tasked with deploying a VersaStack solution with Hyper-V 2016 and Microsoft SQL Server.